What can I send to Netherlands? What items are restricted? With an abundance of outdoor activities to experience in the Netherlands, you may want to take your own equipment with you, such as bicycles, hiking equipment or other heavy items. These items are usually not covered in your airline baggage allowance and you need to pay an additional fee to take them with you. Send My Bag can pick up your bulky and heavy luggage straight from your door and deliver it to any destination, exactly when you need it. You may also decide that you don’t want to carry your main luggage through the airport or train depot, especially if you have multiple transfers. Our luggage service can help take the hassle out of traveling. Our service is also great for groups of travellers with multiple items and backpackers looking to transport their luggage quickly and securely at a fraction of the price a travel company would charge. With numerous English-language degree courses available, the Netherlands is an increasingly popular choice for students looking to study abroad. Send My Bag can help students relocate to the Netherlands, allowing them to bring all the books, equipment and clothing that they need. By sending your luggage to the Netherlands you can save yourself a lot of stress and hassle by avoiding the need to wait in line at bag drop or luggage carousels. You can easily send your luggage and boxes to the Netherlands with Send My Bag. If you are moving to the Netherlands, this means you can bring lots of your favorite things with you to make you feel at home in the Netherlands. With your luggage taken care of, you can focus on discovering your new surroundings. To learn more about sending luggage to the Netherlands, visit our ‘How it works’ page, or our ‘FAQs’. The Netherlands has around 180 golf courses, of which the best are Koninklijke Haagsche, Utrecht de Pan and Kennemer. If you’d like to try out some of these courses, you can do so using your own clubs, rather than hiring clubs when you arrive. You can avoid oversized baggage fees from your airlines by sending your golf clubs to the Netherlands with Send My Bag. Your journey will be much more pleasant since you won’t have to wait around at bag drop or luggage carousels, or have to drag large golf bags with you onto public transport. See further information on how to send golf clubs with Send My Bag, including how best to package your golf clubs. Cycling is very popular in the Netherlands, where it is a very enjoyable pursuit, due to the generally flat landscape and the many cycling routes available. Drivers are trained to be mindful of cyclists, making the Netherlands one of the safest countries for cyclists. Cycling is an excellent way to experience the Netherlands. You can send your bicycle with Send My Bag, having it arrive at your first hotel and then having it picked up again on your return home. Sending your bike to the Netherlands is much easier than checking it into the hold of your plane. You will avoid oversized baggage fees and won't have to carry the bike to and from the airport. Your bike will need to be taken apart and properly packaged before being sent to the Netherlands. Check out our information on bike shipping to learn more. If you are moving to the Netherlands permanently, you will have to consider international removals to the Netherlands in order to move your possessions. Before you give anything to the movers, however, ensure that all your items are carefully packaged so that they arrive in one piece. Use suitable packaging for your items and tape everything up well. You could take advantage of the English-language degree courses in the Netherlands to study abroad and experience another culture. If moving to the Netherlands to study you will need to bring plenty of items with you, such as your course textbooks and many other items, like novels, clothes and photos. Top universities in the Netherlands include the University of Amsterdam, the University of Groningen and the University of Utrecht. Read more about student shipping on our student removals page and find out how to receive your student discount. If you left something behind at home when you moved to the Netherlands, you can ask a friend or family member to put the item in a box and send it on to you - it couldn’t be easier to send a parcel to The Netherlands with Send My Bag. Just make sure you choose a sturdy box when sending a parcel to the Netherlands and tape it up well so nothing gets damaged in transit. Find out more about sending a parcel and learn what you can send with Send My Bag and how to package your items. If you want to send more than parcels, baggage and luggage to The Netherlands, you could try the following options for shipping items internationally, especially if you need to send large items like a wardrobe or a bookcase. You could try air freight to send a large item like a table or armchair to the Netherlands, which normally takes around one to two days. This is usually faster than sea freight shipping, but typically more expensive. The amount you will have to pay when shipping by air freight is determined by the weight and size of your shipment. You will probably also have to pay for the services of a customs agent to handle customs clearance for you. Another cost is getting your items to and from the airport. The price could, therefore, quickly mount up. If you send internationally by air freight to The Netherlands your items will likely arrive at Amsterdam’s Schiphol airport. Instead, you could go for sea freight or container shipping to transport your possessions to the Netherlands. This service can take a number of weeks. Again, sea freight is normally used when shipping large bulky items, such as a table or armchair, which are loaded onto cargo ships in containers. This option can be less expensive than air freight, but you will still need to pay for the services of a customs agent and will need to arrange how to get your items to and from the ports. This means the cost could be more than expected. When using container shipping to the Netherlands, your items will most likely arrive by ship at one of the major sea ports, such as Den Helder or Amsterdam. Most shipments with Send My bag will not be stopped by customs in the receiving country because most countries allow a free personal effects allowance. Personal effects are normally defined as used items that have been in the sender’s possession for at least 6 months. If customs officials find brand new items in your shipment you may be charged applicable taxes and duties. This is something to bear in mind if sending gifts in your shipment. Before sending gifts to the Netherlands, please make sure you are aware of any duties you will have to pay and attach all necessary documentation to your shipment. To show that you are sending only personal effects, you will need to complete a short packing list, written as follows: "1 x Blazer, 4 x Jeans, 3 x Woollen Scarves", etc., rather than as "8 x Used Clothing". Once a major naval power, the Netherlands boasts a wealth of cultural heritage and is famous for its fantastic windmills, historical painters and everyone’s ultimate vacation souvenir - clogs. Now a major European country, the Netherlands embraces modern and cutting-edge design and architecture while preserving its historical roots. 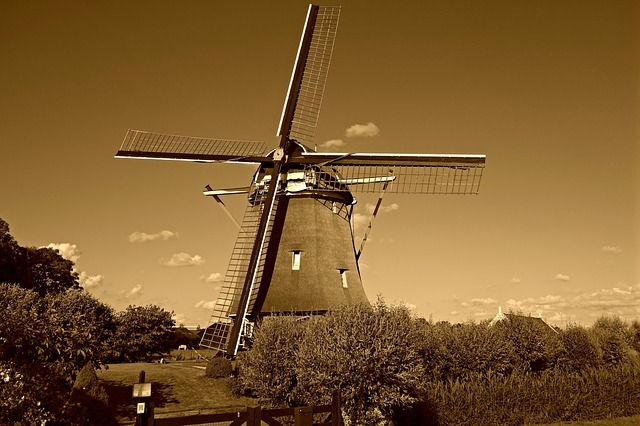 The Netherlands is also the place which brought us famous artists such as Van Gogh and Rembrandt as well as Piet Monet and Frans Hals, just to name a few. The official language of the Netherlands is Dutch, although a large proportion of the total population can understand and speak English as it is a compulsory class in all secondary schools. The Netherlands is part of the EU so uses the Euro, like much of Europe, which makes it a popular stop-off destination. Due to predominately South-West winds, the Netherlands has a moderate maritime climate, especially around the Dutch coastline. This provides cool summers with temperatures ranging between 64 and 73°F and mild winters ranging between 37 and 42°F. These temperatures make it a fantastic destination for those who like to get out and about exploring or taking part in outdoor activities. One of the most popular activities in the country is cycling, and with good reason. The Netherlands has over 13,600 miles of dedicated cycle paths throughout the country, many of them beautifully scenic. Other popular activities include swimming and sunbathing on one of the Netherlands many beaches, and water sports and boating are abundant on the country’s lakes.